On the banks of the Bow River in Australia's south west Walpole Wilderness area is the famous Tree Top Walk 400 kilometres from Perth. East of Margaret River and Walpole , west of Albany and Denmark is the Valley of the Giants and hamlets, Nornalup , Peaceful Bay and Bow Bridge. Comfortable self contained accommodation enclosed by stately old trees nestled in private gardens near the banks of the Bow River. Only a 5 minute drive from The Tree Top Walk, Peaceful Bay and Nornalup, Bow River Cattage is at the gateway to the magnificent Valley of The Giants. Discover a hidden cove at the nearby beaches, go swimming in the crystal clear waters, or cast a line and relax. Partake in holiday activities in the natural beauty of Western Australia; whale spotting, canoeing, bird watching, forest treks, horse riding and wine tasting. Take a scenic drive to a nearby town (Walpole, Denmark or Albany) and experience life south west style. 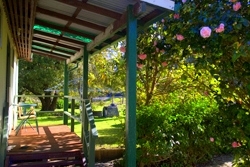 The cottage is handy to Bow Bridge Roadhouse the one-stop-shop which is a landmark in this quiet rural community. 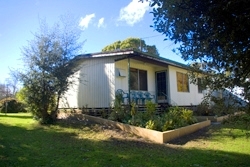 The well-appointed cottage provides self contained accommodation for five people.